Can a teenage superhero stop a mind-controlling menace with a vengeance? 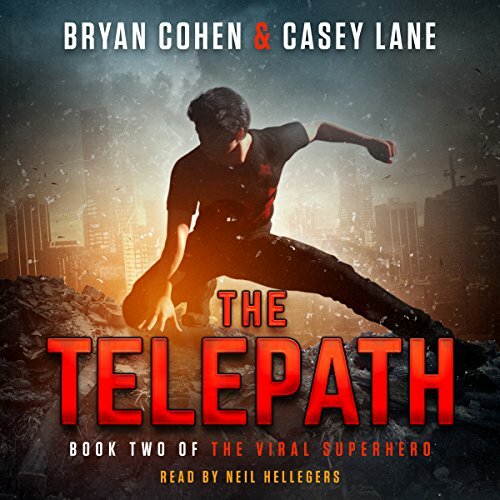 The Telepath is the second novel in the thrilling Viral Superhero Series. If you like breathtaking action, laugh-out-loud humor, and a hint of romance, then you’ll love Bryan Cohen & Casey Lane’s edge-of-your-seat story. This book is an edited and revamped new edition of a novel that was previously published as Mind Over Easy. Buy The Telepath to continue the super-powered series today! Great narration performance again. This story just flew by in a good way. Plenty of action. Love the interactions between Ted and Erica. This series doesn’t disappoint! Looking forward to the next installment in the series! Loved this book, and how the story was told. Impossible not to listen to only once.